NEW YORK -- On its surface, Standings Bar is any New York sports fan's paradise. Quaintly tucked in Manhattan's East Village neighborhood, it features eight HDTVs on the wall to go along with the banners, posters, and even bobbleheads hanging from every conceivable angle. But there is one thing New York sports fans might not appreciate -- at least during the 2012 Eastern Conference Semifinal between the Rangers and Capitals. "For hockey in particular, we've been attracting a lot of Washington Capitals fans," said Gary Gillis, who opened Standings in 2005. "A lot of our patrons who were Washington Capitals fans started coming here for their games and started spreading the word among their friends and things kind of took off from there. Pretty much every Capitals game we get a lot of people here." With the Capitals facing off against the Rangers in three of the last four postseasons, Standings has become central headquarters for New York-area Capitals fans. 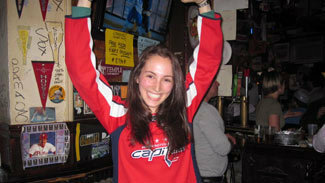 And as the Caps-Rangers playoff battles have intensified across the years, the bar has seen more and more red Alex Ovechkin jerseys come through the door. "Most of the [Caps fans here] know what they're talking about, which is encouraging," said Jessie Leiman, a longtime Capitals season-ticket holder who moved to New York from Washington DC a year and a half ago. "Being in a city that is so far away, it's refreshing." During the course of the Capitals-Rangers second-round series, some Rangers fans have braved the pro-D.C. crowds at Standings. One fan watching Wednesday's epic Game 3 at the bar was teased by a group of girls about Rangers' keeper Henrik Lundqvist. But for the most part, the exchange between opposing fans was civil during a triple-overtime win by the Rangers that won't be forgotten anytime soon. Things weren't so calm during Game 7 of Washington's opening-round series against the Bruins, when a group of Boston fans descended on the bar, making Caps fans a much smaller majority. "It was stressful. I don't like sitting next to guys who are cheering for Brad Marchand," said Turan Tuluy, another DC native-turned-NYC resident and Caps diehard. "It was tough, but I had a lot of backup." The bar erupted that night when Joel Ward notched the series-winning goal in overtime. Fans jumped on chairs and tables, beer flew everywhere, and Standings was assured at least two more weeks of rocking the red. "It was a neat atmosphere. You feel bad for the other team's fans that come here and realize they're the minority. Don't get me wrong, I don't feel bad for them [Bruins fans], they won the Cup last year," said Leiman. "It felt like I was back at Verizon Center." A common admiration for the Caps has kept Washington fans coming to Standings. And even though the triple-overtime heartbreaker in Game 3 was a tough one for the Caps faithful, it doesn't appear that they'll stop congregating at this quaint East Village sports bar anytime soon. "This is my home away from home," said Tuluy. "When I come here, I feel like I'm in my extended living room."